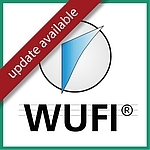 The new versions WUFI® Plus 3.0.3 and WUFI® Passive 3.0.3 have been released. Please find an overview of alterations and setup instructions in the update overview. Free-of-charge updates are listed on the WUFI® online shop in the section „my orders“. The displayed link allows you to download the respective latest version which can be update to for free. Please extract the file and install the software using your existing licence number (usually identified automatically). Earlier versions don’t have to be uninstalled. Chargeable upgrades will be displayed at the online shop when you log in with your WUFI® account.